Haq's Musings: How Will Robots Impact Late Industrializers Like India and Pakistan? How Will Robots Impact Late Industrializers Like India and Pakistan? Export oriented manufacturing industries have helped a succession of newly industrialized countries like Indonesia, Japan, Hong Kong, Malaysia, South Korea, Taiwan and China create more and better jobs and rise from low-cost manufacturing base to more advanced, high-end exports. As a country's labor gets too expensive to be used to produce low-value products, some poorer country takes over and starts the climb to prosperity. Will this formula help create more and better jobs in late industrializing countries like Bangladesh, India and Pakistan? Will programs like Indian Prime Minister Narendra Modi's "Make in India" help create more and better manufacturing jobs to bring prosperity to his country? To answer this question, let's look at a recent World Bank report. 1. Labor productivity has risen faster in manufacturing than in the wider economy. 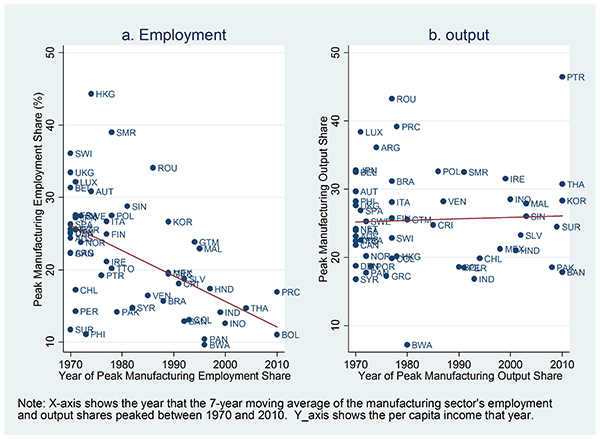 Higher levels of manufacturing output are now compatible with lower levels of manufacturing employment. the following figure confirms this, showing that peak manufacturing employment shares have fallen over time. Peak output shares have not. A key factor this report does not fully acknowledge is the dramatic advance in artificial intelligence (AI) leading to the rise of much more capable robots. To put this in perspective, let's understand that the industrial revolution in the West moved a lot of jobs and people from farms to factories beginning in the 18th century. As a lot of low-cost, low-value manufacturing has moved to cheaper locations in the developing countries, there has been a major transition from manufacturing jobs to service sector jobs in the industrialized nations. Now the application of robots on the factory floors is putting pressure on manufacturing jobs everywhere---in developed as well as developing nations. Even low-cost manufacturing jobs in garment industry are being challenged by highly capable sewing robots from companies like SoftWear Automation, a textile-equipment manufacturer based in Atlanta in the American state of Georgia. Here's how Economist Magazine describes it: "The company is developing machines which tackle the problems of automated sewing in a number of ways. They use cameras linked to a computer to track the stitching. Researchers have tried using machine vision before, for instance by having cameras detect the edge of a piece of fabric to work out where to stitch". There's a company in Silicon Valley called Industrial Perception which is focused specifically on loading and unloading boxes and moving boxes around. This is a job that up until recently would've been beyond the robots because it relies on visual perception often in varied environments where the lighting may not be perfect and so forth, and where the boxes may be stacked haphazardly instead of precisely and it has been very, very difficult for a robot to take that on. But they've actually built a robot that's very sophisticated and may eventually be able to move boxes about one per second and that would compare with about one per every six seconds for a particularly efficient person. So it's dramatically faster and, of course, a robot that moves boxes is never going to get tired. It's never going to get injured. It's never going to file a workers' compensation claim. Essentially, it's a machine that produces very, very high quality hamburgers. It can produce about 350 to 400 per hour; they come out fully configured on a conveyor belt ready to serve to the customer. ... It's all fresh vegetables and freshly ground meat and so forth; it's not frozen patties like you might find at a fast food joint. These are actually much higher quality hamburgers than you'd find at a typical fast food restaurant. ... They're building a machine that's actually quite compact that could potentially be used not just in fast food restaurants but in convenience stories and also maybe in vending machines. Essentially it looks at the raw data that's provided from some source, in this case from the baseball game, and it translates that into a real narrative. It's quite sophisticated. It doesn't simply take numbers and fill in the blanks in a formulaic report. It has the ability to actually analyze the data and figure out what things are important, what things are most interesting, and then it can actually weave that into a very compelling narrative. ... They're generating thousands and thousands of stories. In fact, the number I heard was about one story every 30 seconds is being generated automatically and that they appear on a number of websites and in the news media. Forbes is one that we know about. Many of the others that use this particular service aren't eager to disclose that. ... Right now it tends to be focused on those areas that you might consider to be a bit more formulaic, for example sports reporting and also financial reporting — things like earnings reports for companies and so forth. Basic income guaranteed for all: First proposed by Richard Nixon in 1969 as “Family Assistance Plan”. Government will collect taxes and distribute basic assistance to allow people to subsist. If they choose to work, they can earn more money to have a higher standard of living. People have moved from agriculture to manufacturing to service jobs over the last two centuries. Now highly-capable robots are threatening to replace workers in all sectors. Major disruptions are likely to occur to build a new economic order that offers everyone a dignified existence in future. Such an order could be a combination of peer-to-peer economy, work-sharing through shorter work weeks and basic guaranteed income for all. French philosopher Voltaire said: “Work saves a man from three great evils: boredom, vice and the need”. Basic guaranteed income only takes care of “the need”, not “boredom, vice”. Then it is very much possible that a robot or a software programme cud search the internet or any other media, dig out all data/reports which prove Pakiland superior to India and then write out an article based on that. Who will read your musings then? You shud be afraid- very, very afraid. On Wednesday HSBC released its research for the past month indicating that the Service Sector Business Activity Index in India fell in May to 49.6 from 52.4 in April, showing a contraction in the sector (WSJ). This is the first time the index has fallen below 50 since May 2014. Services sector contributes 60% to India's GDP. The findings follow other recent indicators, such as industrial production, freight traffic, and bank credit, that show India’s economy is struggling to gather momentum, despite recently revamped GDP data showing a robust expansion. HSBC said competitive pressures and natural disasters were to blame for crimping demand. However, businesses are optimistic that a broader improvement in the economy would lead to a pickup in activity over the next year. A similar survey by HSBC released Monday showed manufacturing activity expanded at the fastest pace in four months in May. A gauge of services activity in India contracted for the first time in 13 months in May amid a decline in new orders, indicating that a recovery in the South Asian economy is likely to remain sluggish. The seasonally adjusted Service Sector Business Activity Index fell to 49.6 from 52.4 in April, according to HSBC research released Wednesday. This is the first time since April 2014 that activity in the services sector, which contributes about 60% to India’s gross domestic product, has contracted. A figure above 50 indicates expansion, while a reading below that signals a contraction. HSBC said competitive pressures and natural disasters were to blame for crimping demand and hurting order flows. However, businesses are optimistic that a broader improvement in the economy would lead to a pickup in activity over the next year. The findings follow other recent indicators, such as industrial production, freight traffic and bank credit, that have shown India’s economy struggling to gather momentum, despite recently revamped GDP data showing a robust expansion. GDP data last week showed that India’s economy grew a solid 7.5% in the three months ended March 31, making it the fastest-growing big economy in the world. But the big revisions and the conflicting signals with other indicators have led economists to question the reliability of the data. While services activity is still weak, the manufacturing sector gained momentum in May, highlighting that the economic recovery is still patchy. A similar survey by HSBC released Monday showed manufacturing activity expanded at the fastest pace in four months in May. HSBC also said Wednesday that input price pressures had intensified. Higher inflation could reduce the space the Reserve Bank of India has to lower interest rates. The RBI cut it main lending rate by a quarter-percentage-point Tuesday, but cautioned about risks of a rise in inflation, indicating that interest rates may have little room to go down any more. There is no option but to improve education in Pakistan and make it available to everybody. I think other than providing infrastructure, the government needs to increase teachers' salaries to make it an attractive profession for college graduates, and to improve teacher training. Which means the instructors in teacher training programs have to be highly qualified and well paid as well. The faster government moves to close the educational quality and quantity gap, the better off Pakistan will be, with or without robotic manufacturing. 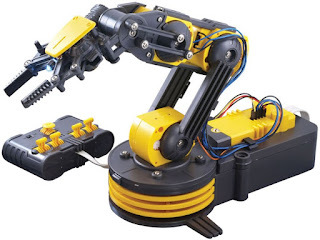 According to the International Federation of Robotics, an association of academic and business robotics organizations, China bought approximately 56,000 of the 227,000 industrial robots purchased worldwide in 2014 — a 54 percent increase on 2013. And in all likelihood, China is just getting started. Late last month, the government of Guangdong Province, the heart of China’s manufacturing behemoth, announced a three-year program to subsidize the purchase of robots at nearly 2,000 of the province’s — and thus, the world’s — largest manufacturers. Guangzhou, the provincial capital, aims to have 80 percent of its factories automated by 2020. The government’s involvement in this process shouldn’t come as a surprise. The Chinese government (nationally, and in Guangdong) has long wanted to shift the country’s manufacturing away from low-quality products that are manually assembled and toward higher-value ones — like automobiles, household appliances and higher-end consumer electronics — that require the precision of automation. And it’s no secret that demographics aren’t on the side of China’s traditional, labor-driven factories. Urbanization, population control policies, and cultural shifts have pushed China’s average birth rate below those in more developed countries like the United States. Meanwhile, as a result of growing urban affluence, workforce participation rates are in decline, especially among women. Together, these factors are pushing wages upward, with an average annual increase of 12 percent since 2001. That trend offers plenty of incentive to factory owners and government officials to pursue automation. Of course, what looks sensible from the perspective of the economic planner’s office is more distressing from the factory floor. In March, Caixin, a Chinese business magazine, reported that Midea, a major Chinese manufacturer of air-conditioners and other appliances, plans to cut 6,000 of its 30,000 workers in 2015 to make way for automation. By 2018, it will cut another 4,000. What will happen to those and the millions of other low skill workers who will be displaced by the shift? The answers offered so far by companies and government officials haven’t been very reassuring. When Foxconn, the contract manufacturer for many Apple products, announced in 2011 that it was beginning a three-year program to replace some of its workers with as many as 1 million robots, the company said it was doing so out of a “desire to move workers from more routine tasks to more value-added positions in manufacturing such as R&D.” But even if those intentions were sincere, Foxconn never gave any indication that it would have enough higher-skilled positions to employ every displaced iPhone assembler. Meanwhile, officials in Guangdong Province and their supporters in the Chinese media argue that the government-subsidized robotics industry will provide plenty of employment opportunities in robot manufacturing. But even if displaced low-skilled workers can be funneled into those jobs as rapidly as the Chinese government suggests, there’s no guarantee that the resulting jobs will pay as well as those they replace. In fact, with so many displaced workers seeking to fill them, they might even pay less, according to a recent study of automation’s impact on labor markets. Their hands fly with the speed and precision of veteran assembly-line workers, pausing only to flick sweat from their shiny-smooth foreheads. They construct box after cardboard box, designed for sari shops in far-off cities, stacking them into multi-hued towers that loom above their small, hunched bodies. Many of the workers are not yet teenagers, and they fill the dimly lighted corridors of the textile mills and warehouses of this industrial city in western India. Despite a law requiring every child younger than 14 to be in school full time, millions of Indian boys and girls still hold jobs, including more than 50,000 in Surat alone, according to estimates by human rights groups. India has declared that it wants to end child labor, but advocacy groups argue that a new government proposal could actually push more youngsters into the workforce, jeopardizing their education and putting them at greater risk of exploitation. Prime Minister Narendra Modi's Cabinet last month approved amendments to a 3-decade-old child labor law that would make it legal to employ children younger than 14 in "family enterprises" not deemed hazardous. Children would be barred from mining, heavy industry, manufacturing fireworks or other dangerous professions, but could participate in virtually any other sector as long as the work was outside school hours in a business run by relatives, says a government statement on the legislation. Modi's conservative government said it was seeking to strike "a balance between the need for education for a child and the reality of the socioeconomic condition and social fabric in the country." In many poor Indian families, boys and girls assist their parents from an early age, and proponents say an outright ban on child labor could harm small farmers, shopkeepers, cooks and others who rely on young hands to help them scrape by. Critics say the amendments send the wrong signal from Modi's government, which has been trying to revive India's lumbering manufacturing sector and promote foreign investment through a glossy campaign dubbed "Make in India." "There is a feeling that if children are blocked from working, the garment industry or other industry might suffer," said Prabhat Kumar, child protection manager for the international charity Save the Children. "But if you really look at the issue, this won't be the case. No one would support the idea of 'Make in India' meaning 'Made by Children.'" The "2015-16 State of the Future" just released by The Millennium Project gives trends on 28 indicators of progress and regress; new insights into 15 Global Challenges; impacts of artificial intelligence, synthetic biology, nanotechnology and other advanced technologies on employment over the next 35 years; and how economic change is inevitable by 2050. “This ‘World Report Card’ may have more data, information, intelligence, and wisdom about the future of the world than has ever been assembled in one report,” says Jerome Glenn, CEO of The Millennium Project and lead author of the report. “It should be read in pieces and kept on your desk as a reference.” The 14-page executive summary is freely available in several languages. This is the 18th global assessment of the foreseeable future. It distills much of the leading research from UN organizations, national governments, think tanks, and insights from thought leaders around the world. This 300-page report includes over 50 charts and graphs. “It is what the educated world citizen should know,” says Elizabeth Florescu, Director of Research for The Millennium Project and co-author of the report. Each "State of the Future" since 1997 builds on the last one, creating an accumulative and unique assessment of the future of the world. The concept of work will change over the next generation or two; but global thought leaders are divided about the best policies to make a smooth transition. By 2050, new systems for food, water, energy, education, health, economics, and global governance will be needed to prevent massive and complex human and environmental disasters. Environmental security should be the focus of joint goals to build strategic trust between the US and China. The 2015 State of the Future Index shows slow but steady improvement in general human welfare over the past 20 years and next 10 years—but at the expense of the environment and with worsening intrastate violence, terrorism, corruption, organized crime, and economic inequality. The future can be much better than most pessimists understand, but it could also be far worse than most optimists are willing to explore. Humanity has the resources to address its global challenges, but it is not clear that an integrated set of global and local strategies will be implemented together timely enough and on the scale necessary to build a better future. The Millennium Project is a global participatory think tank connecting 56 Nodes around the world that identify important long-range challenges and strategies, and initiate and conduct foresight studies, workshops, symposiums, and advanced training. Its mission is to improve thinking about the future and make it available through a variety of media for feedback to accumulate wisdom about the future for better decisions today. It produces the annual "State of the Future" reports, the "Futures Research Methodology" series, the Global Futures Intelligence System (GFIS), and special studies. Over 4,500 futurists, scholars, business planners, and policy makers who work for international organizations, governments, corporations, NGOs, and universities have participated in The Millennium Project’s research, since its inception, in 1992. The Millennium Project was selected among the top ten think tanks in the world for new ideas and paradigms by the 2013 and 2014 University of Pennsylvania’s GoTo Think Tank Index, and as a 2012 Computerworld Honors Laureate for its contributions to collective intelligence systems. India's manufacturing value added (MVA) per capita of 161.7 in 2013 is among the lowest in the world. It's up from 131.9 in 2008. In fact India's 2008 MVA per capita of 131.9 was lower than Pakistan's 141.1. Since 2008, Pakistan's MVA per capita has slipped to 139.1 in 2013 while India's has increased to 161.7 in this period. Bangladesh's MVA per capita has jumped from 82.2 in 2008 to 118.3 in 2013. The little striker wearing a crescent moon and star jersey lines up his penalty and kicks right, netting his goal as the keeper dives the wrong way and hits the ground yelping in pain. Both players are teammates practising to represent Pakistan in a major world football tournament. Unlike their low-ranked flesh-and-blood counterparts, however, these are advanced robots whose programmers are set to compete against students from the world’s top universities as they look to showcase what their country can do in the world of Artificial Intelligence. Students at Pakistan’s National University of Science and Technology (NUST) will this year for the first time send a team to the annual RoboCup, an event featuring 32 universities that will be held in Leipzig, Germany from June 27 to July 4. The six machines are NAO humanoid robots purchased from France’s Aldebaran Robotics at a cost of roughly US$17,000. It is in fact the third year that NUST, Pakistan’s premier engineering institute, has qualified for the prestigious cup. But a lack of travel funds has meant their dream of representing their country on the world stage had to be placed on hold – until now. “Our dream came true this year when the university managed to allocate 1.5 million rupees (US$14,336) for the team’s travel to Germany,” Dr Yasar Ayaz, head of the department of Robotics and Artificial Intelligence told AFP. The amount is enough only for three students instead of all 10 involved in the project to travel to Germany and participate in the event, and the university is still hoping to close the gap with funding from sponsors. “We are not disheartened...something is better than nothing,” Ayaz said. The first robot football league was started in 1993 by a group of Japanese researchers and named the Robot J-League, after the Japanese professional league. Following a surge of outside interest, the initiative was extended into a international project and the Robot World Cup Initiative, or “RoboCup“, was conceived. The first edition was held in Osaka in 1996. Its stated aims: “By the middle of the 21st century, a team of fully autonomous humanoid robot soccer players shall win a soccer game, complying with the official rules of FIFA, against the winner of the most recent World Cup.” For the time being, however, that goal appears a long way off. Students tap away at their laptops in their university lab, programming their code. Zain Murtaza, who leads the ten-member team, sets up the cute robots on their nine-by-six feet pitch, and the action begins. Each robot has two cameras on their faces guiding their movements. “The cameras take pictures and feed them to the computers installed inside, which help them decide about their movements and recognise movements of the other players,” Ayaz explains. They walk around the field with short staccato movements, pulling their legs back like a golfer lifts his club before unleashing an ungainly kick that sends the plastic orange ball rolling along the floor. Mishaps and tumbles are frequent, and the process makes for awkward viewing.